A pilot cutter meets up with the barque Kilmeny at the end of her final voyage in 1921 as described to me in the words of her second mate Eben Anderson, in chapter 3 of my book, Windjammers – The Final Story. Kilmeny was typical of hundreds of small barques built towards the end of the 19th century and used for world tramping. She remained in trade until 1921 when her owners, J. Hardy, sold her for scrap. 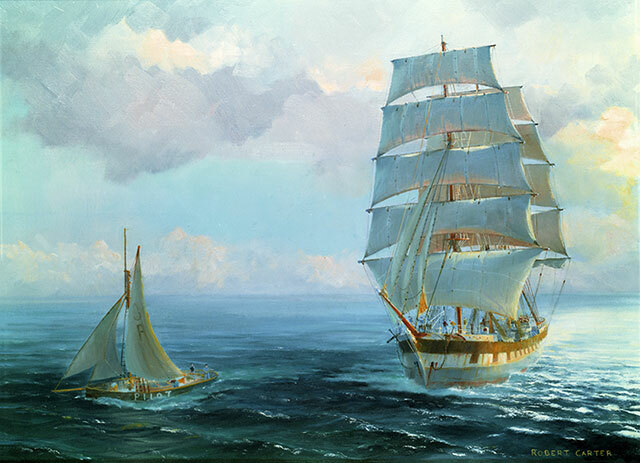 She was rigged without royal sails and as such was described as being ‘bald-headed’. 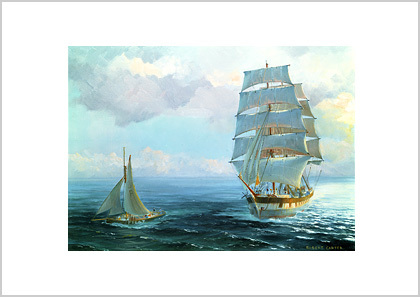 The absence of royals may have offended the eyes of seamen but her second mate claimed her as his favourite ship. To compensate for the lack of royals, the upper and lower topgallant sails were wider and deeper. The painted ports favoured by British shipowners are patent here. They were adopted on ships trading to China in the mid 19th century, in an attempt to deter Chinese pirates who might think they had fallen in with an armed vessel. They became a form of decoration until the early 20th century. A pilot cutter meets up with the barque Kilmeny at the end of her final voyage in 1921.